Welcome to the data exploration using Analytics Canvas tutorial. This tutorial aims to give you an overview of data exploration features in Analytics Canvas. Data Viewer: Data preview of the raw data. Data Profiler: Data structure and selection of statistics. Data Chart: Graphical representation of the time series data. At the bottom of the screen, you will be able to see a preview of the data that you loaded in. You can also open Data Viewer by clicking on the input or output stub of a block, or on a connector line between blocks. There are many things available to you in Data Viewer. If you want to sort the data in a column, in ascending or descending order, you can click on the little triangles in the right corner next to the column names. You can explore the data by right-clicking and selecting “Show Data Type by Color”. Dates will be highlighted in light blue and numbers in brown. Data Profiler allows you to quickly evaluate the quality of your data. To access the Data Profiler, click on the input or output stub of a block, or on a connector line between blocks. Then select the “Data Profiler” tab at the lower left of the screen, or in the toolbar buttons above the Main Canvas. If your dataset is too large, you may be prompted to select which columns you wish to profile; otherwise all columns are provided. Data Type – the declared data type for the column. Missing rows – for string types the count of rows containing the empty string. Minimum – the minimum value within the column for numeric columns, the earliest date for date columns. Maximum – the maximum value within the column for numeric columns, the latest date for date columns. 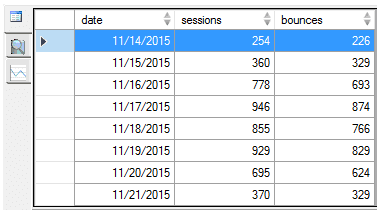 You can drill down into the rows by clicking on the bar in the column category count graphs. The Data Chart tab is used to visualize the dataset. The Data Chart displays variables as a time series chart, and it can be used to examine changes in data over time. You can zoom in and out by clicking on the data and selecting the time frame that you are interested in.